Nial McCabe’s machining workshop at the County College of Morris campus is a good example of where the American economy could be headed in the next decade. After all, as McCabe says, we need to become a society that makes things again. Most of you probably remember Nial from his steam engine plans that we’ve linked to before, and may also remember that he teaches applied mechanics at County College of Morris in New Jersey. As a professor at the New Jersey community college, Nial has taught the trade for the last two decades and in that time its progression from being closely guarded to one with communities spread across the internet, ready to share stories and plans. Hobbyists—and especially their proliferation on the internet—have helped bring about a resurgence in home machining, Nial said. He recalled that 15 or 20 years ago, as he was learning the trade, he could rely on his father or a few others to help him learn the ropes, but there were many more who guarded their knowledge. Today, because of the internet the secretive nature is gone and even a complete beginner can learn about using a lathe or building a simple project with one click on You Tube. With more people wiling to share their knowledge Nial hopes it could mean more interest overall in engineering. Nial got into engineering because of his father, a railroad mechanic born in England. His father would bring home bits of locomotives or other parts for a fascinated Nial to explore. From that early experience he was hooked and always worked with his father on projects and “typical immigrant stuff” like fixing cars or working on plumbing. So he went to Trenton State College where he studied to be an industrial arts teacher. He found work in a high school, working primarily in drafting and a small auto shop, and there some of the older teachers taught him to use the lathe and drilling machine. In the last few years he has seen a boom in popularity in the hobby, especially among men who work in professional settings. His theory is that most of these people went to college and got degrees in things like accounting or medicine, and never got to do the hands-on work that their fathers or grandfathers did. So now, with more free time and money to spare, this generation is going to Home Depot for equipment and trying on small projects. For the moment, that means increases in sales and a suddenly wide-open market for internet companies catering to these hobbyists, Nial said. But in the long-term, it could lay the groundwork for a resurgence in engineering itself. 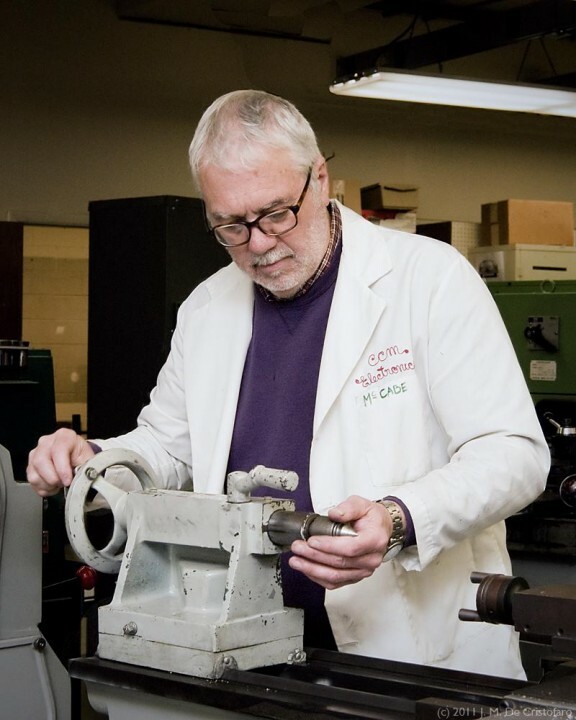 For his own students, skills on the lathe and other machinery translate into one of the most important factors for students and their parents—jobs after graduation. Students at County College of Morris are required to work in co-op settings, and Nial is seeing more openings in the tool and die trade than anytime in the last 30 years as many of the older workers retire. There are also openings for these students in installing and setting up machinery equipment, or designing CAD drawings for machine systems. With the sudden interest in energy efficiency and building new facilities to LEED standards, Nial said many of the students find work in designing and installing HVAC systems. Another 25 percent of the students work in the military, he said. Even with the increase in jobs, enrollment for mechanical programs has remained steady, Nial said. In the 90s he watched computer science programs grow in popularity, as the “unsexy but solid” mechanics programs lumbered along. Then, when interest in computer science crashed along with the dot com bust of the early 2000s, mechanical programs still lumbered. Nial doesn’t predict much will change with that, and interest in this trade will keep steady. The positive about that, he said, is there will never be more graduates than there are jobs. 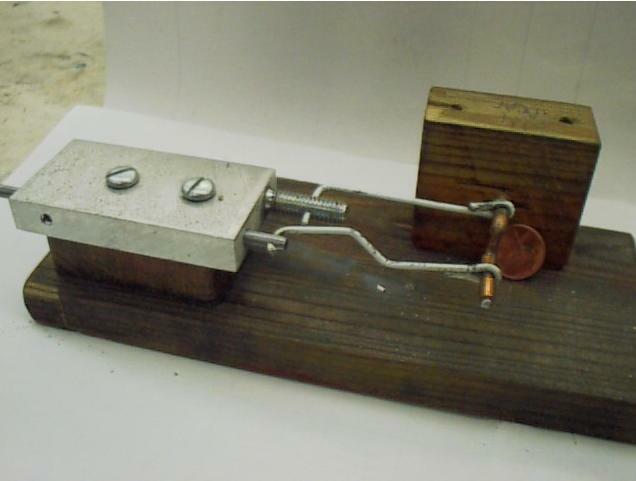 This is a simple “wire crank” engine that uses a small piece of aluminum plate and coat hanger wire. Like most of his designs, Nial’s page for the EZ Engine includes a brief description of the project, a photo and 3D image along with more detailed blueprints for the project. The EZ Engine. If that looks like coat hanger, that's because it is a coat hanger. Building one of these (the “McCabe runner”) was my very first engine project. It’s what got me started in hobby machining. His website is no-frills, but the plans are perfect for those just starting out. Kudos to Nial for making basic engineering fun!